A co-worker and teammate shared this earlier today in our dev chat room as an example of a cool interactive piece, and boy is it ever. It’s been way too long since I posted on Keefer Madness, and this was a great thing to break the KM radio silence of the last few months. It’s this simple, yet varied piece with simple controls where you’re controlling a figure through the woods, walking, running and jumping with music and audio the whole time. Mouse clicks also have an effect, I found. It’s really simple on the surface but ends up being pretty varied and I’m sure took a ton of time to create and develop. Both from a visual standpoint, and a development standpoint, it’s really impressive. Make sure you look too at the “Images” link on the site, as it has some neat behind-the-scenes of the making and planning. Way to Go is an interactive experience for human beings between 5 and 105 years old. Maybe it lasts six minutes; maybe it lasts forever. Way to Go is ready for your web browser and willing to go VR, if you’re Rift-y. It is like a grey squirrel balanced on a branch, fearless. 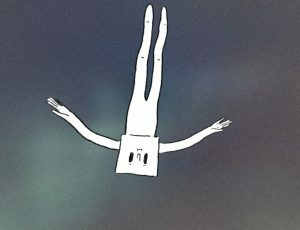 Made by Vincent Morisset, Caroline Robert, Édouard Lanctôt-Benoit and the studio AATOAA, visionary creators of BLA BLA and Arcade Fire’s award-winning Just A Reflektor. Produced by the National Film Board of Canada, co-produced by France Televisions, with a mesmerizing soundtrack by Philippe Lambert, it is a game and a solace and an alarm, a wake-up call to the hazards of today. At a moment when we have access to so much and see so little, Way to Go will remind you of all that lies before you, within you, in the luscious, sudden pleasure of discovery.